A police chief has admitted he was not satisfied officers received enough training to deal with the G20 protests in London last month. 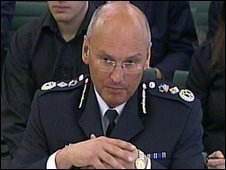 Metropolitan Police (Met) Commander Bob Broadhurst told the Commons Home Affairs Committee officers only had two days of crowd control training a year. He said any inappropriate behaviour would have been because of fear. During the protests, newspaper seller Ian Tomlinson, 47, died minutes after he was pushed over by a policeman. Met Commissioner Sir Paul Stephenson said footage of police allegedly attacking protesters was a "real concern" and needed to be "thoroughly investigated". When asked if it was his view the footage showed behaviour which was incompatible with British policing, Sir Paul said: "No that's not my view. My view is that I am concerned with what I saw and it should be investigated." Commander Broadhurst, who was responsible for drawing up plans for policing the event, defended his officers as the majority had "never faced a situation as violent as that". When asked if he was satisfied officers received sufficient training, he said: "No I'm not." The commander told the committee there had been no large scale public protests in recent years and many of the officers at the G20 protests were brought in from other boroughs. 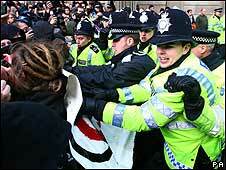 He said: "I do have a concern that some of our officers have not faced that. "I would like to train them more but we don't have the time." Commander Broadhurst also said he was proud of the "restraint" he witnessed from officers in the face of provocation. He said: "What I have seen on the television are only the types of tactics that I train (officers) to do down in Gravesend. "I've not seen anything that particularly concerned me in the overall." He added there were lessons to be learned from the way the protest was handled. Commander Broadhurst said he stood by a statement made after Mr Tomlinson's death on 1 April, which he said he made using the facts he knew at the time. He told the committee at the time of Mr Tomlinson's death he was in the police control room at Lambeth with access to CCTV footage but he had no way of rewinding it. Commander Broadhurst also added the controversial tactic of containing protesters or "kettling" was the "best option" rather than the potential of widespread disruption caused by protesters.